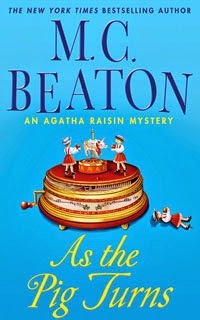 As the Pig Turns is the 22nd novel in the cozy mystery "Agatha Raisin" series by MC Beaton. The Agatha Raisin series is my #1 all-time favorite cozy mystery series, so I treated myself to As the Pig Turns for Christmas to get caught up. At this point, there are 25 books in the series, and the 26th book entitled, Dishing the Dirt is due to release in fall later this year. Eager to get back home to the small village of Carsely after Christmas break, Agatha Raisin is frustrated when she finds herself stuck in a traffic jam in freezing temperatures. While sitting in her car and waiting for traffic to start moving, a policeman gives disgruntled Agatha a ticket for taking her hands off the wheel. A few days later, Agatha attends a local winter festival and realizes that the roasted pig prepped for the spit is actually the torso of the unruly policeman, complete with a sewn-on pig's head. Agatha is a sleuthing home-wrecker! Considering Agatha now runs her own private detective business, she jumps right into trying to figure out who chopped up and dismembered the cop. While all this is going on, Agatha's bright, young protégé Toni dates a snobbish older man to keep herself occupied, thanks to Agatha convincing Toni's previous boyfriend to enlist in the army months earlier. After meeting Toni's new boyfriend, Agatha instantly feels guilty for having stuck her nose where it didn't belong, and tries making it up to Toni in various random ways. I've realized that for the last few Agatha Raisin books I've read, I've been more into the drama between the main characters than the actual mystery itself. One moment I was enjoying reading about Agatha's man drama involving Charles, Roy, James, and the hot new gardener George, and the next, the book was over. I was enjoying all the "extra" stuff between the main cast so much, that I hadn't even realized that Agatha had the murderer apprehended, and there was nothing else due to happen. The mystery was solved. I love the sense of community in MC Beaton's novels. Even though Agatha Raisin is a temperamental old bat most days, she still does good by her small town (which is comprised of people who really don't like her all that much), and brings all those small-town criminals to justice.